Had gone to another colleague’s wedding, this time at Felda Air Tawar 2 which is 30km from Desaru. Using the Senai Desaru expressway is a breeze to get to Desaru. Desaru the name implies – “Village of Casuarina”, You can see lots of these trees lining the beach area. It is a nice place to relax by the sea, away from the busy city life to de-stress. Just outside the junction of Desaru and the Expressway is a building complex where you can get nice coffee and food at Chamek Kopitiam. Kopitiam is a Chinese dialect which means Coffee Shop. You should try the Roti Canai there. Housed nearby is a shop selling fishing gears for fishing enthusiasts and another selling local snacks for those who like to snack. 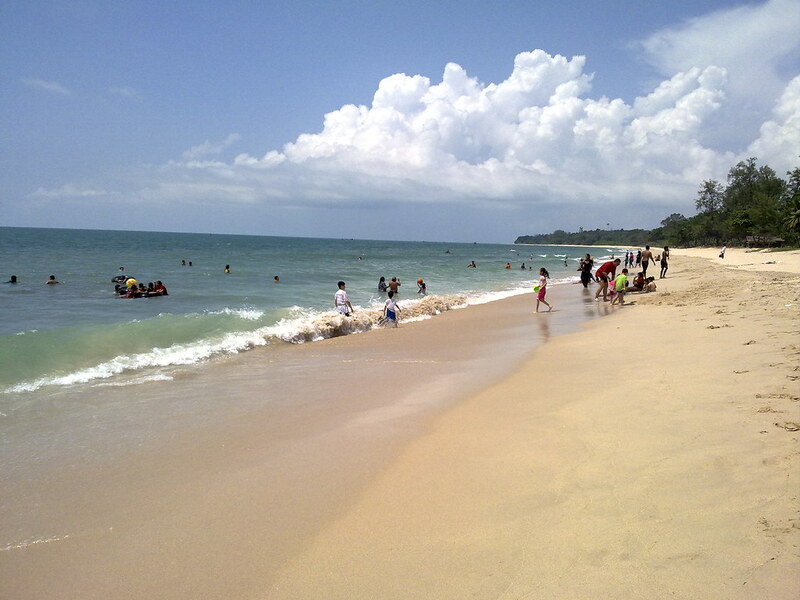 Desaru is still pretty much unexploited and you can still enjoy all kind of activities at the beautiful beach. Have a look at the beaches of malaysia – best around the world. access is public and be through. sure there are beaches in Tioman and Redang elsewhere in the east coast that are much prettier but this is the best nearest to singapore. You can ride the banana boats at Lotus Desaru or just have a quiet time at the Pulai, one of the better hotels around. Access to the beach for the public is indicated via signboards or ask a local otherwise all the hotels have beach front access and all the beach fronts are public all 22 km of uninterrupted stretch. Do not swim during monsoons as there is undercurrent that drag you to the deep sea and there are no lifeguards. Other than hanging out at the beach, there are still lots of activities you can do at Desaru. For example, cycling in the remote part is just one of them. The trip to Desaru Ostrich Farm was unexpectedly joyful. The guide was friendly and knowledgeable. The ostriches were divided in quarters according to their age. So we managed to see the youngest to the oldest of ostrich. The souvenirs are expensive and gathering dusts. They should lower the price and renew the packaging. We had our lunch at Surf n Turf which was delicious. The meals were all ostrich-meat based. We enjoyed the omelet and the satay. This was our first time to Ostrich Farm. The presentation by the guide was informative and definitely helped us understand Ostriches better. There would be a lot of time for you to “interact” with the Ostriches. We were told that these big birds were supposedly to be very timid but their size could be intimidating. IMO, Ostrich omelet and satay was ok and the steak had an acquired taste but tender. Beware of the Ostrich pee!! Do not stand behind them for a wet experience! There is a very poplular ostrich farm at Desaru. You won;t be disappointed especially for kids. The farm provides the best way for us to interact and learn about ostrich. The ostrich farm is pretty small, so you can spend just an hour there to learn everything about ostriches and buy a bunch of vegetables to feed them. Interesting and informative. The folks that man the place are helpful and friendly too. For another RM20 your kid can sit on an ostrich and take a photo which will then be pasted on a ‘certificate’ to take home – cheesy fun. But take some time to try out the food there. The ostrich satay was surprisingly tender and juicy. We visited the fruit farm which was quite easy to find. Our first agenda was to have lunch as it was rather late. It was a hot day and we started lunch with flavoured ice shavings. As we were a large group, we ordered one of each flavour available. The kids told me the chocolate flavoured version is as good if not better than any they have tasted. I enjoyed the mango flavoured while the durian version was disappointing. After lunch we had a go at the dirt kart – go-kart on the dirt track. They only have one 2-seater cart so we had to organise ourselves the split to ensure a fair race among the children and adults. As there was no crowd, we were offered more rounds than normally sold but it was not communicated to the janitor at the track. They reinstate the extras after verification. The farm tour is transported on a truck converted as a bus. The guide is quite knowledgeable but they should have a microphone and speaker to allow all in the group to hear clearly. It was an opportunity for children to see fruit trees and get a feel of how cultivation works. The mini-zoo at the end smacks of animal cruelty as they do not seem well taken care of. It is a bit sickening to see these animals caged in such poor condition although the management surely tried their best to introduce a multiple and enriching experience in the same environment. The fruit pack at the end of the tour was rather refreshing. For the adventurous, there is karaoke, massage and other health products available. 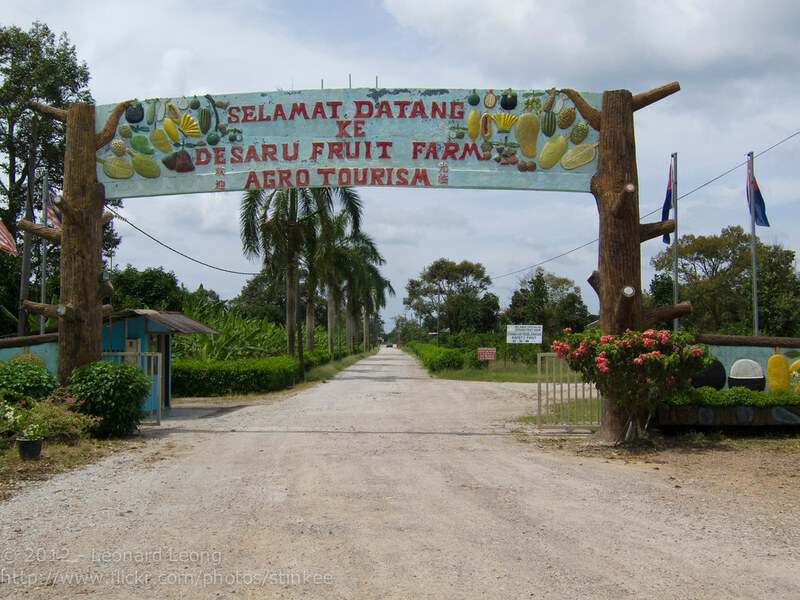 You can find a popular fruit farm at Desaru. Do visit the farm if you have time because it will be highly educational and and fun for not only kids but adults. We managed to get onto the boat as it was rather full. You grab a stool and sit on the deck. There is no arrangement at all. Be warned there is also no safety briefing for the faint hearted. It was rather dark and the boat moved slowly to the mangrove area just across the jetty. An assistant splashed water onto the vegetation and sure enough you see the little stars blinking at you in the dark. The first wave of excitement was enough to get everyone to the side of the boat creating a danger of the boat becoming unbalanced. This is where a briefing in advance will help. So the trick is to seat on the starboard of the boat or you have to be patient and wait for the boat to turn around. Overrall the sight of a swamp of firefly winking in harmony in the dark is an experience I will recommend to many. Desaru boasts 25km of inviting beaches fringed by palms and casuarinas. It lies in the south-eastern corner of Johor, approximately 98km from Johor Bahru. The waters here are conducive for swimming, water-skiing, canoeing and catamaran sailing. Moreover, this popular seaside destination in Johor is great for a family vacation. Its 18-hole golf course commands magnificent view of the South China Sea. In Desaru, you can enjoy thrilling adventures such as learning how to fly an ultra-light aircraft or take part in a go-kart race. In other words, Desaru is perfect for sea sports. Other forms of recreation include jungle trekking, horseback riding, archery and off-road adventures. Accommodation here includes hotels as well as budget chalets, dormitories and camping grounds. A long stretch of coastline at Desaru. The Desaru International Triathlon is held here annually. The Tanjung Balau Fishermen’s Museum, a few kilometers away, features exhibits on the lifestyle of the local fisher folk. You can drive from Singapore to the Desaru Ostrich Farm. It lies between Desaru and Sungai Rengit. The journey is about one and a half hours. 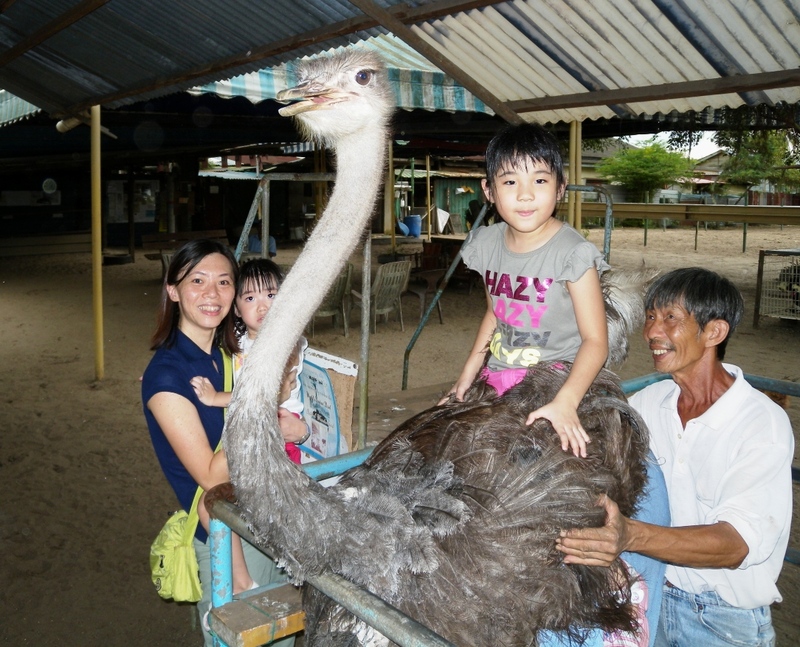 The Desaru ostrich farm is located at 15 Teluk Ramunia in Johor, Malaysia. The entrance fee for adults is RM 15. It opens daily from 10 am till 6.00 pm. In this farm you will be shown how the chicks are hatched from the egg. The ostrich meat is sold to the shops where they are made into the tasty “satay” (ostrich meat barbequed over a charcoal fire and eaten with a peanut sauce). The ostrich egg is huge and can withstand the full weight of a man. On weekdays the farm is rather quiet as there are few visitors. On weekends the farm is more crowded and hence it is better to visit the farm on a weekday if you want to avoid the crowd. Desaru is easily accessible as there is public transportation from Johor Bahru, Kota Tinggi or Tanjung Belungkor. Buses are available from Kuala Lumpur. There s a ferry service from Changi Point in Singapore to Tanjung Belungkor where transport to Desaru can be arranged. Islands off Mersing – The state’s beautiful offshore islands, Sibu Besar, Sibu Hujung, Sibu Tengah, Sibu Kukus, Rawa, Aur, Pemanggil and Tinggi are accessible from both the Mersing and Tanjung Leman jetties. Aur Island, along with Dayang Island, Lang Island and Pinang Island, are rated among the best diving destination within the Johor Marine Park Area. Gunung Ledang – In the north, Gunung Ledang or Mount Ophir at 1,276m provides a challenging two-day return trek passing through waterfalls and forests. At the relatively flat summit, a panoramic view of the Straits of Malacca and Sumatra coastline can be seen on a clear day. Also, a popular picnic spot is the Gunung Ledang Waterfall, at the base of the mountain. Endau-Rompin National Park – Explore the vast wilderness rainforest in this park, one of the peninsula’s largest virgin lowland forests. It is a major conservation area to the diversity of flora and fauna found within. There are some 26km of jungle trails within the park, the most well-trodden path being the grueling 16km trail from Kuala Jasin to Batu Hampar and Buaya Sangkut, with numerous rapids crossings. At Buaya Sangkut, be enchanted by the beautiful sight of a waterfall. Danga Bay – Situated along the popular Lido Beach, Danga Bay is great place to unwind, relax and just watch the city go by. Sample the delicious fare available from the number of restaurants serving both local and international cuisine. Nasoha Spices and Herbs Paradise – A few kilometers from Pagoh town in the district of Muar, lies the Nasoha Spices and Herbs Paradise. This 1,000ha spice and herb farm is home to hundreds of medicinal plants. There is also accommodation and a restaurant at the farm. Next post: A Place Where You Can Swim Along With Sharks!